As a player Louis Tyon provided valuable leadership on a team that brought a Class B state championship to Pine Ridge High School. Later he returned to his alma mater as a counselor and provided caring guidance to countless students. The Thorpes played an exciting brand of basketball that featured fast-paced offense and high-energy defense. Tyon was a 6-foot forward who led the charge. Chuck Gustafson coached Pine Ridge and guided the Thorpes to the state tournament when Tyon was a sophomore in 1961. They finished seventh and gained important experience in the process. Pine Ridge returned to the tourney the following season with increased confidence and determination. This time the Thorpes won the championship. But the title did not come easy. The Thorpes opened the tournament by using 19 points from Tyon to get past Murdo 55-51 in overtime. In the semifinals they edged defending champion Bridgewater 36-34. Championship night matched Pine Ridge against McIntosh and its star guard Homer White Buffalo. Tyon converted two late-game free throws among his 15 points and Pine Ridge claimed the title with a 70-68 victory. White Buffalo had 22 points in a losing cause. The Thorpes finished with a record of 25-3. Tyon’s all-around outstanding play earned him a spot on the all-state team, an honor he would repeat the following year as a senior. Pine Ridge again reached the championship game of the tournament in 1963 but had to settle for the runner-up trophy. Alexandria downed the Thorpes 82-65 in the finals. In his junior and senior seasons Tyon averaged 20 points per game and was Pine Ridge’s leading rebounder. And he filled a key role in the effective full-court press that was so vital to the Thorpes’ success. Tyon then attended Northern State University, where he played for Coach Bob Wachs. He later transferred and earned his degree at Black Hills State University. 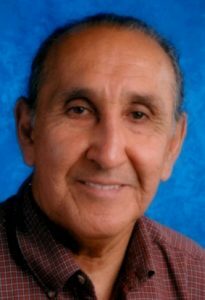 During a distinguished career on the faculty at Pine Ridge he was recognized for his many contributions. Tyon was nominated for National Counselor of the Year in 2002 through the Office of Indian Education Program in conjunction with the National Indian School Board Association. On the nominating news release from Pine Ridge it was stated that Tyon had been instrumental in formulating effective school policies and had provided exceptional services to the students. A tireless performer in the fast-breaking style of the Thorpes of the early 1960s, Tyon has remained a devoted running enthusiast. He has participated in a number of marathons. Tyon is now retired and lives in Park City, Utah. His wife is Catherine. Children are Misty and Louis.